The Total Balance supplement by Xtend-Life definitely lives up to its name. It provides the "perfect balance" of nutrients for your health. The first thing you should know about Total Balance is that it is much more than a simple multivitamin. It's actually 5 products packed into 1 bottle. It's a Multivitamin, plus an Amino Acid blend, plus Digestive Enzymes, plus an Immunity Booster, and finally also an Eye Health product. •	First, the Multivitamin part includes all 13 vitamins and 11 essential minerals. •	The Amino Acids аre required for muscle growth and organ repair. •	The Digestive Enzymes help your body to break down food better and extract nutrients from it. •	The Immunity Booster helps your body resist colds and other viruses. • And finally the Eye Health blend includes powerful antioxidants which slow down the age-related deterioration of your eyesight. If you buy all these products separately, the total cost will easily exceed $100. But with Total Balance, you won't pay anywhere close to that. All in all, Total Balance Men's contains 80 active ingredients, which makes it the most comprehensive nutritional supplement we've come across. Now, that being said, there is ONE thing we DON'T like about this product. It contains only 500IU of vitamin D. And we believe that amount should be higher. But this is a problem common to most multivitamins out there. So if you don't live in a sunny place and you can't sunbathe regularly in order to make your own vitamin D, we recommend adding a separate vitamin D supplement to your multivitamin regimen. Now that we got this out of the way, Total Balance has many, many things we actually love. The company has a brand new, state-of-the-art manufacturing facility, which has been registered with the FDA. That facility is also GMP-certified, which means that the products made there are of very high quality. That's all good but what makes Total Balance better than the hundreds of other multivitamins on the market, you might ask? Unlike most other companies that use cheap synthetic ingredients, Xtend-Life uses more expensive natural nutrients. What this means to you is greater potency and better nutrient absorption. And that you will not be throwing your money down the drain. Their tablets are covered with an enteric coating which protects the nutrients from being damaged by the acid in your stomach. That way the vitamins are delivered to the intestines intact, where they are absorbed into your bloodstream. This is a very good thing and it further increases the benefits you get out of these nutrients. Xtend-Life offers an unprecedented 365-day money-back guarantee on all its products. So if for whatever reason the supplements don't work for you (which is very unlikely) you can return the bottle and get all your money back. Most manufacturers will never give you a refund once you open the bottle. But Xtend-Life does. For a full year. The supplements are made in New Zealand, which is great because that is one of the cleanest and least polluted countries in the world. This means that the ingredients included in the product are pure and free of contaminants. Xtend-Life has customers all over the world and can ship directly to your home, no matter where you live. Shipping is usually quite fast. They have a great customer support team that you can chat with online or on the phone. They will be happy to answer all your questions. In summary, Total Balance is an excellent product that offers great value for the price. How does Xtend-Life Total Balance compare with other multivitamin brands? 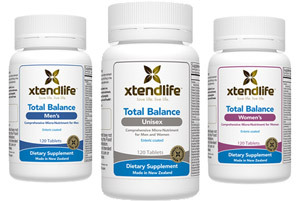 MultivitaminGuide.org offers comparison between the Xtend-Life Total Balance multivitamins and of all major vitamin supplements available on the market. Some of the unique aspects of this guide include comparison of the Xtend-Life Total Balance multivitamins with 100 other vitamin supplement products, including popular brands such as One-A-Day, GNC, Equate, Kirkland, Shaklee, Nature Made, NOW Foods, Melaleuca, Puritan’s Pride, Herbalife, TwinLab, and Walgreens. The table below provides a summary of the Effectiveness Scores of some of the more popular vitamin supplement brands available on the market, including the Xtend-Life Total Balance multivitamins.